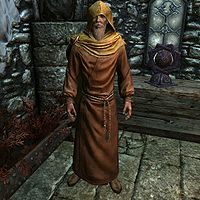 Styrr is an elderly priest of Arkay at the Solitude Hall of the Dead. He wears hooded monk robes and a pair of boots. He wields an iron dagger and carries a belted tunic and some common gold and loot. Styrr's scheldule is strange, because he is one of the few non-vampire characters who is nocturnal. He wakes up at 8pm, and wanders around the Hall of the Dead. After hanging out in the Hall all night, he stays up a little longer until he goes to bed at noon. When greeted, he'll say, "Hello, my child. Arkay watch over you." and "May Arkay bless you with a long life, a proud death, and a restful grave." If you ask him how long has he tended the Hall of the Dead, he'll say, "All my life. I practically grew up in the Hall. My father and mother were the priest and priestess of Arkay before me, you see. I believe I was put here to protect this place from the darkness that pervades Solitude." You can now ask him what darkness pervades Solitude, to which he'll say, "This city has a long history of madness and murder. The Wolf Queen... Pelagius... The death of High King Torygg... And now, public executions. My books tell the stories. Have no doubt - as pretty as its streets are, as jovial as the bards may be... darkness is drawn to Solitude." If you ask him if the man who was executed is buried in the Hall, he'll say, "You mean Roggvir. Yes. I made an appeal to Captain Aldis. He allowed Roggvir to have a proper Nord burial, as is the custom in Solitude." When exiting conversation, he'll say, "May Arkay bless you with a long life." and "May the light of truth keep the darkness at bay." During the quest The Wolf Queen Awakened, Falk Firebeard will send you to Styrr for help to deal with Potema. When you greet him, he'll now say, "You must be the one Falk spoke so highly of. Welcome." When you tell him Falk sent you, he'll say, "Ah Potema. Former queen of Solitude and one of the most dangerous necromancers in recorded history. She was responsible for the Empire's near collapse almost five hundred years ago. I believe I have a book about her..." You can now ask if Potema has returned, to which he'll say, "Summoned in spirit form is not raised from the dead. She'll need help before she can return to the living. For the moment, the Wolf Queen has retreated to a place filled with dead eager to serve her. She has gone to her old Catacombs. A few days ago, one of her servants busted through a wall into the Temple of Divines. We'll need you to go into the Catacombs themselves." You can now ask if you're going alone, to which he'll say, "Yes. I had Falk call you back because you were at the summoning, you have a connection to Potema now. You must deal with her. I can provide you with help for her minions though. This should help you deal with the Catacombs themselves." Or you can say you can do it, to which he'll say, "Yes. I had Falk call you back because you were at the summoning, you have a connection to Potema now. You must deal with her. I can provide you with help for her minions though. This should help you deal with the Catacombs themselves." Either way, he'll then teach you the Turn Undead spell and say, "As to Potema herself, find what's left of her body, likely a skeleton. Remove it from the Catacombs and bring it back to be sanctified by Arkay." You can also ask him what you need to know about Potema, to which he'll say, "A curious figure. Unrepentantly evil and nasty, of course, but also astonishingly brilliant, and obviously quite a necromancer at her end.She was always so close to being Empress, but despite her machinations, it was never to be hers. Ironically, if she were alive today, she'd be the only living member of the Septim bloodline. By all rights, she would now be Empress." When exiting conversation, he'll say, "Taking on Potema won't be easy. But you are the one to do it." If you greet him before dealing with Potema, he'll say, "You know what needs to be done. Is there something more you need?" After you deal with Potema and return to him, he'll say, "You've returned! I'm hoping successfully." When you tell him you have Potema's remains, he'll say, "Excellent! These things do have a way of working out when people take action. I'll sanctify the remains. In case Falk doesn't make it clear - Solitude owes you a debt of gratitude." This page was last modified on 17 July 2013, at 02:37.